Exploring possible future economic impacts of constructing a deck over the existing Kensington Expressway. In the early 1960s, the City of Buffalo’s Humboldt Parkway – designed by famed landscape Architect Frederick Law Olmsted – was removed to make way for the Kensington Expressway (NYS State Rte. 33). The new one-and-a-half mile expressway was recessed below grade while two roads where constructed at-grade along either side of the expressway to provide access to adjacent housing. The new expressway divided several historic neighborhoods in half and has remained a physical barrier in the community to this day. This study was commissioned by the New York State Department of Transportation (NYSDOT) to determine the possible economic impacts of constructing a $560 million (2015 dollars) deck over the existing expressway. The proposed three-quarter mile deck would be designed to resemble a portion of the previously demolished Humboldt Parkway and restore pedestrian connections across the expressway, all while allowing traffic to flow freely below. UBRI researchers used industry standard input-output modeling software (IMPLAN) and a predictive regression model to explore impacts over a 30 year timeline that span three distinct development scenarios. 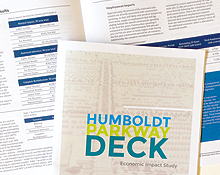 The study focuses on potential estimated impacts related to the proposed deck from construction spending, spin-off infill construction, and the appreciation of home values in surrounding neighborhoods. The results show increases in regional economic activity, local property values, tax revenue to Erie County and the City of Buffalo, and regional employment.